"King Kamehameha was a great warrior," said Kahakahi'i, who was sitting cross-legged in the sun, naked to the waist, when I stopped to watch him carve a weapon, a traditional Hawaiian knife. "King Kamehameha was a great warrior," said Kahakahi'i, who was sitting cross-legged in the sun, naked to the waist, when I stopped to watch him carve a weapon, a traditional Hawaiian knife. "The King fought many battles on this island. 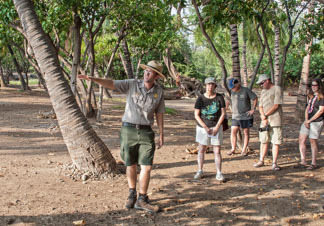 But not here in Pu'uhonua o Honaunau," he said, breaking cover for a moment to explain that he was an employee at the City of Refuge National Historic Park, on the Big Island's south Kona Coast, in Hawaii. "This was a sacred place, a retreat where kahunas performed secret ceremonies, and where the king came to pray," he told a group from Iowa who crowded around the thatched, Polynesian-style shelter to see what he was making. When the talk turns to famous generals, you could argue that Hawaii's King Kamehameha I, famously known as Kamehameha the Great - conqueror of the Hawaiian Islands between 1781 and 1810 - was every bit as shrewd and as skilled as his more celebrated contemporary, George Washington. But unlike Washington, Kamehameha's fame is local. And even here, in Hawaii, he remains something of a mystery. Though his rivals were legion and the battles he won were well-planned, his reputation rests primarily on oral histories, stories remembered, repeated and past to the next generation. Burnished in the glow of the past, he's shines as a mighty warrior, a charismatic leader and a just but autocratic king. What facts exist come from meetings recorded by a few foreign visitors who described his commanding presence, thoughtful courtesy and calm intelligence. Indeed, the very qualities we despair of finding in today's leaders. But there was, I hoped, a way to get a glimpse of this remarkable man and the times in which he lived: follow his path to some of the places that mark his evolution from promising youth to revered leader. 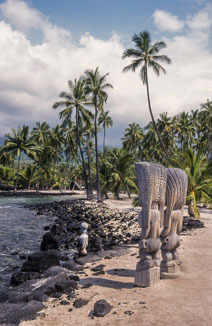 I began the journey in an odd and unexpected place: the Courtyard King Kamehameha's Kona Beach Hotel, in Kailua-Kona, which just happens to sit on what was once Kamehameha's royal compound. Here, in Kamakahonu Bay, a block from a busy intersection, is his last home, the restored, thatched Ahuena Heiau (sacred temple). Built in 1812, it was his retreat and refuge until 1819, when he died. By then, most Hawaiians had adopted Christianity. But Kamehameha, loyal to the old gods, vowed he would die as he lived. Today the royal grounds are the venue for the hotel's award-winning Island Breeze Luau, an outdoor dinner theater highlighting Hawaiian dance and dress styles over the decades. Digging into a generous helping of "kalua pig" with rice and poi, as the drummers chanted and the dancers swayed, I couldn't help wondering what the king would think. Kamehameha, born in north Kohala, (some say as early as 1740, others say 1758, the year of Halley's Comet), a turbulent period of frequent clan wars, was raised in secret -- and in safety --in the remote Waipio Valley. But it was at Kealakekua Bay, ten miles south of Kailua-Kona where the young Kamehameha first showed his chops -- and where I went first. In 1778, when Captain Cook landed at Kealakekua Bay, the young man accompanied his uncle, King Kalani'opu'u to the landing site, where they met Cook and toured his ship. Seeing the strange newcomers' iron tools, knives, muskets and canons, Kamehameha quickly realized that these white men and their weapons would someday make good allies. Four years later, in 1782, Kamehameha defeated his first rival, a hostile cousin, near Moku'akae Bay, a mile farther south, near Ke'ei. Known as the Battle of Moku'ohai, it won Kamehameha the support of Kona's leading chiefs and ensured his future control of north Kohala and the Waipio Valley. I stopped to see the bay but had to imagine what had happened there, and how. 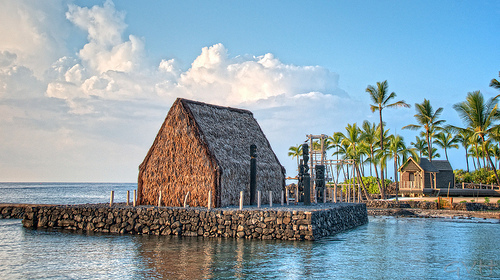 From here, I continued south, following the signs to my next stop, Pu'uhonua o Honaunau National Historic Park. Truly a City of Refuge, this was the sacred site where condemned criminals able to outrun their pursuers were guaranteed sanctity and absolution. But members of the ali'i, royalty like Kamehameha, came here, too, to perform secret prayer rites. 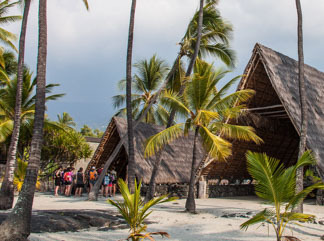 Stop at the Visitors Center first, then walk through the site to see traditional Hawaiian thatched shelters and cultural and craft demonstrations. 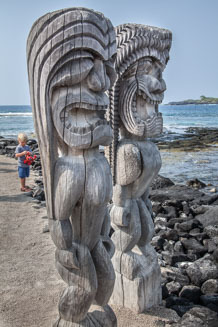 The heiau (temple), closed to visitors and guarded by carved figures of Hawaii's many gods, perches behind a fence beside the ocean. 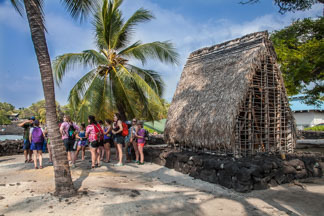 To follow Kamehameha's footsteps north, drive 35 miles north of Kailua-Kona to the Pu'ukohola Heiau National Historic Site, an enormous rock heiau overlooking the ocean. Dedicated to Kukailimoku, Kamehameha's family war god, the king built this vast monolith in 1791, an offering for success in battle. A polyhedron-shaped stack of boulders, carried to the site by thousands of workers, it was built in less than a year. To sweeten the gesture, the king also restored the smaller and much older heiau close by, once used for human sacrifices. With paths circling the hill, this spot is ideal for ocean views, photos, fresh air, and long or short walks. Walk the downhill through a shaded grove and you'll come to tiny Pelekane Bay, where Kamehameha defeated his last Big Island enemy, another rival cousin. Learn more about it at the Visitors Center, staffed by informed rangers who sell history books, maps, charts, prints and souvenirs. As for the Ahuena Heiau, back where I started, at the Courtyard Kamehameha's Kona Beach Hotel, it's said that when Kamehameha died, a loyal follower prepared his bones according to an ancient ritual and secreted them nearby, most likely in a cave somewhere along the coast. After Kamehameha died, his son and heir and a Christian, destroyed most of the sites and artifacts of the old religion. As for Kona, the town, when the young Kamehameha became chief of Kona, he made it his seat of government. And thus it remained throughout his life. If you've got time, squeeze in a stop at Kaloko-Honokōhau National Historical Park, an ancient village near the man-made fishponds so essential to cultural life, now an archaeological site, near Kona. I had trouble finding the road, so ask for directions. Visit www.nps.gov/puhe/learn/historyculture/kamehameha.htm for more information. 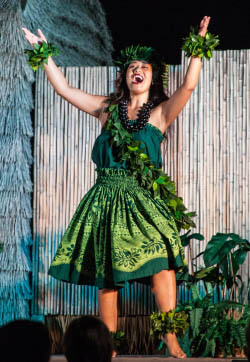 For tickets to the Island Breeze Luau, a dinner theater, call (808)329-2911. The Courtyard King Kamehameha's Kona Beach Hotel is at 75-5660 Palani Rd., Kailua-Kona, Big Island. A three-star property, the hotel has restaurants, free parking, pool, spa, beach, shop and other amenities. At www.konabeachhotel.com. Photos courtesy of Steve Haggerty/ColorWorld and with the permission of the Courtyard King Kamehameha's Kona Beach Hotel.